If there's any advice we can bestow upon you this month, it's to check out Phantoms live. 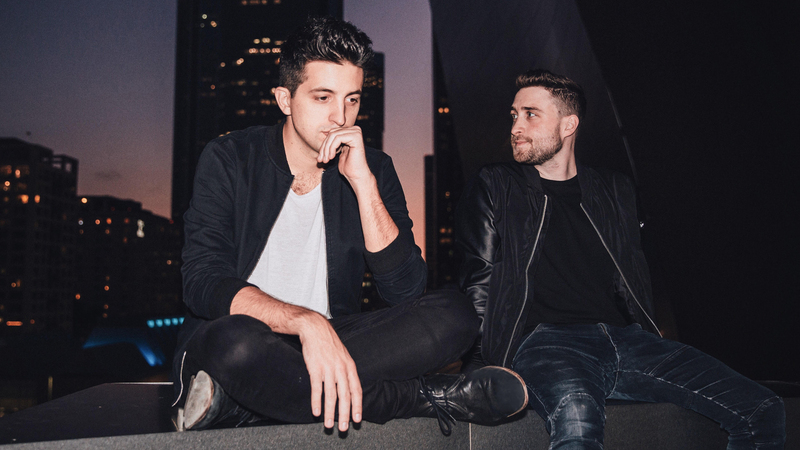 The electro-pop duo, made up of Vinnie Pergola and Kyle Kaplan, put on a hell of a show, and can be seen diddy bopping throughout their set between drum pads, synthesizers, and midi controllers. From the first track to the final note of the last song, the guys' energy is next level. Recently, the "Just A Feeling" musicians released their debut eponymous album which contains 11 tracks filled with strobey beats and entrancing electro-pop grooves to get lost in. Our personal favorite? "Throw It In The Fire", a bass-heavy gem that begs to be blared at full volume. In support of its release, the guys hit the road for their first headlining tour, bringing the dance party to venues across the US. The run, which kicked off on October 11 in Philly, will take them to cities like Denver, Portland, Vancouver, and Seattle before wrapping in Sacramento on November 19. Before they embarked on their journey, we wanted to find out who they wanted to see live from the crowd this year. From Nicolas Jaar to LCD Soundsystem, Phantoms' taste is en pointe. Check out their picks below, then make sure to Track the two-piece on Bandsintown to stay up-to-date with all their touring news! It goes without saying, but these guys are the pioneers of electronic music and were a very early influence for us. Last time they were in the LA area it was during their “Alive 2007” tour and we weren’t able to get tickets on three separate occasions. So instead of watching the show live we obsessively watched pixelated YouTube videos taken of the show from the nosebleed section of whatever arena they were playing. Biggest regret of our concert-going lives, PLEASE TOUR AGAIN. We’ve seen Nico live a few different times now over the last five years and it’s still a brand new experience every single time. The last time we saw him at the Fonda Theater in Los Angeles, he didn’t play anything resembling a dance-able beat for about a full hour, yet the audience was completely captivated. Just as you felt you had a grasp on the show, new production or instrumentation was unveiled and it became a completely different experience. Not a lot of people can pull off what he does, so his show is always a must-see when he comes to town. As the years go by this one seems less and less likely to happen, but hot dog we boys would love to see this show. As teenagers we watched their Pulse concert DVD over and over. Pink Floyd had festival-level stage production about 20 years before it became the standard. They crash a goddamn airplane into the stage, who does that?! Another giant influence. We got to see them once about 10 years ago at one of the HARD Fests. Their live show is such a complicated mix of analog synthesizers and drums, yet it never feels too heady or geared towards synth nerds. It is a dance party. We try to emulate the flow of their early shows with our set when they would play a seamless set, mixing together live versions of their original tracks and their remixes of other artists. Please come back to America, Soulwax. We miss you. Back in 2008 or 2009 LCD played the Palladium in LA. We bought tickets, got there about three hours before doors and rushed to the front of the stage. It’s still one of the best concert experiences of our lives. James Murphy is one of the most unlikely presences to command a stage, but you can’t stop watching him. I vividly remember both of us losing our minds when they played 10-minute-long synth jam “Yeah (Crass Version)”. They are coming back to the Palladium this November and we are definitely getting in that crowd and dancing like we did almost 10 years ago.